Controversy has erupted over an exhibition to be opened by Bulgarian Culture Minister Boil Banov on May 8 that “highlights the role of Tsar Boris III” and “presents the role of the Bulgarian state authorities” in the rescue of Jews from the Holocaust during the Second World War. The exhibition is being condemned as an attempt at rewriting Bulgaria’s history. The exhibition, entitled “The Country of the Rescued Jews” – which opens on the eve of Europe Day – is part of the programme of the Bulgarian Presidency of the Council of the European Union, according to a May 4 media statement by the Culture Ministry. The media statement says that the exhibition contains “secret reports, letters, telegrams of German diplomats in Sofia during the Second World War, as well as representatives of the Gestapo and the highest German state apparatus. 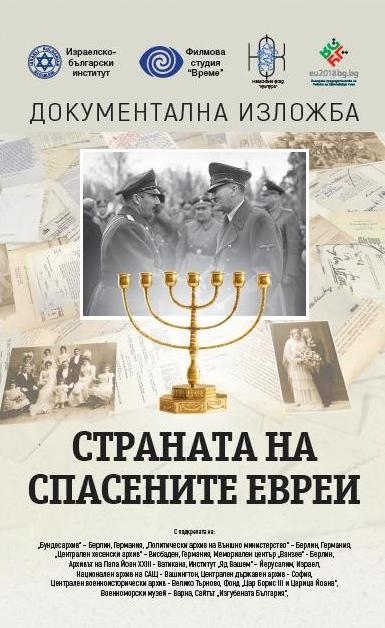 Documents of Adolf Hitler, Adolf Eichmann, Ernst Kaltenbrunner, Angelo Roncalli, Adolf Beckerle and Joachim von Ribbentrop present the role of the Bulgarian state authorities in the salvation of the Jews during the Second World War”. The exhibition presents thousands of transit visas for Jews from Slovakia, Hungary, Romania and the former Yugoslavia who, with Bulgarian help, managed to emigrate to Palestine, and records related to Bulgarian ships that “testify to thousands of Jewish refugees who have received an invaluable chance of emigration and have left Constanta, Mangalia and Varna to Istanbul or Haifa,” according to the statement. It also highlights the role of Tsar Boris in the salvation of the Jews, as well as the heavy diplomatic moves associated with this action, the statement says, adding that the documents come from the Bundesarchiv and German Foreign Ministry archives in Berlin, the Vatican Archives, the Naval Museum in Varna and the Central Military Archives in Veliko Turnovo, among others. The thrust of the description of the exhibition runs counter to the fact that at the time of the Second World War, when an agreement existed between Hitler’s Germany and the Bulgarian government – then an Axis member – to deport Bulgarian Jews, this plan was stopped because of determined opposition by the Bulgarian Orthodox Church, some political leaders, intellectuals and ordinary members of society. In 2018, Bulgaria is marking the 75th anniversary of the rescue of the Bulgarian Jews, and the deportation of more than 11 000 Jews from the “new lands” in northern Greece and Yugoslavia, then under Bulgarian administration, who were murdered at Treblinka. Asked to respond to the claims made by the exhibition, Maxim Benvenisti, a member of the executive board of the Organization of the Jews in Bulgaria “Shalom” and chairman of the Foundation of Holocaust Survivors in Bulgaria, said that the Bulgarian pro-Nazi government had consciously prepared and approved the anti-Semitic Defence of the Nation Act in Parliament, had taken steps to implement it, as well as doing everything possible for the implementation of the law to be heavy on Bulgarian Jews. “These same authorities prepared and carried out, as an ally of the German Nazis, the deportation of the Jews from the ‘new lands’,” Benvenisti said. Sofia Cohen, head of the Central Israelite Religious Council of Bulgaria, said: “We sincerely hope that today’s Bulgarian society will be given an explanation why precisely now, during the Bulgarian Presidency of the EU, the feats of the Bulgarian people are being replaced with pseudo-history that the pro-Nazi government rescued the Bulgarian Jews”. Viktor Baruch, a 97-year-old prominent writer and a Holocaust survivor, poured scorn on the exhibition’s claims, saying that the role of the state in “saving” the Bulgarian Jews “can best be seen by reading the transcript of the National Assembly meeting of November 15 1940, when it began deliberations on the Defence of the Nation Act”. Dr Alexander Oscar, President of the Organization of the Jews in Bulgaria “Shalom”, said that the May 8 event, on the eve of Europe Day, which marks 73 years since the capitulation of Nazi Germany and the end of the Holocaust, “is a provocation against the noble work of the Bulgarian Orthodox Church and a society that was not fascist, that exerted their efforts and showed unprecedented nobility, to protect their compatriots from the plans of the pro-Nazi authorities and prevented the deportation of the Bulgarian Jews to the death camps”. Veni Markovski, a well-known internet pioneer and author of numerous articles directed against hate speech, said that such an exhibition, “which presents only positive cases of hidden opposition to the decisions of the authorities and the anti-Semitic laws that had been adopted, while ignoring or not mentioning the role of Tsar Boris III and his pro-Nazi government in the National Assembly and the Cabinet regarding starting deportations, distorts the historical truth and doesn’t lead to more knowledge, but to more disinformation”. It is understood that a joint declaration by numerous individuals condemning the exhibition for distorting Bulgaria’s history is to be issued soon.